Meditation means cessation of the thought process. Meditation is not a technique but a way of life. It describes a state of consciousness, when the mind is free of scattered thoughts and various patterns . Meditation means to drop everything which is in one’s memory and to come to a state where only consciousness remains, where only awareness remains. Meditation does not mean remembering something or someone. When only consciousness remains without an object, that state is called meditation. 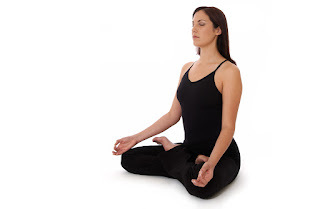 Meditation is rest, absolute rest, a full stop to all activity – physical, mental, emotional. When you are in such a deep rest that nothing stirs in you, when all action as such ceases – as if you are fast asleep yet awake – you come to know who you are. Meditation is a technique for working with the mind. If you think of the mind as a tool then the first step in putting it to use should be to examine it; then reflect on how it works and its possible uses; then put it to work as efficiently and effectively as you can. Meditation is a natural way of getting to know the mind so that we can investigate and understand how it works and then improve it through training. It takes a lot of practice to train the mind. Meditation is the way to bring us back to ourselves, where we can really experience and taste our full being, beyond all habitual patterns. In the stillness and silence of meditation, we glimpse and return to that deep inner nature that we have so long ago lost sight of amid the busyness and distraction of our minds. Meditation is an intensely personal and spiritual experience. The desired purpose of each meditation technique is to channel our awareness into a more positive direction by totally transforming one's state of mind. The individual preparing to meditate usually starts off by harnessing his awareness, such as focussing his mind onto a certain object. Once attention gets engaged, concentration turns into meditation or dhyana. And through continuous meditation, the meditator merges with the object of concentration, which might either be the present moment or the Divine Entity. Preparation, posture, length of period of meditation, particular verbal or visual elements—all contribute to the various forms of meditation..
Reflective Meditation: Reflective meditation is also known as analytical meditation and refers to disciplined thinking. Reflective ideas which are focused on, such as:- Who am I?, What is the true purpose of my life?, What is my role in this universe?, How can I help remove the sufferings of others? Heart-Centered Meditation : Heart-centered meditation will help in releasing all fears and sadness and bathe in the radiance of loving kindness and compassion. It is also known as the heart chakra meditation. Creative Meditation : It focuses on strengthening qualities, such as appreciation, joy, compassion, patience, empathy, love, gratitude, compassion, humility, fearlessness, and tenderness, among others. Please read below from Medical Angle. From the time of our birth till death the heart works continuously. The strength required to pump the blood up to 42 ft high and weight of 1 tonne is generated by the heart everyday through its work. We take rest when we are tired but if the heart takes rests for 4-5 mins we will have to rest forever.